Good grief, they’re asking for comments on the South Yarra portal? Given the amount of work that’s already occurred, I would have thought the chances of any significant changes being made must be close to zero! Sounds like a “box-ticking” exercise to me. The Werribee and Sunbury lines were realigned during the building of RRL, with plenty of school holiday disruptions, so I imagine there’ll be more of the same. On the Western Turnback, I have wondered the same thing – why West Footscray and not Sunshine (particularly thinking about Sunshine’s role as a western transport hub). Of course, trains can turn around at Sunshine now, but there is no room for an additional platform at the moment. And there is room at West Footscray – where Platform 1 used to be in the old station. It looks like the ramp will use most of that old space. The stairs to the new platform look like they’re facing the wrong way for efficient access. There is a separate entrance for the new platform, but off the existing concourse – so once you’re on the concourse you’ll know which platform to go to for the next City train. 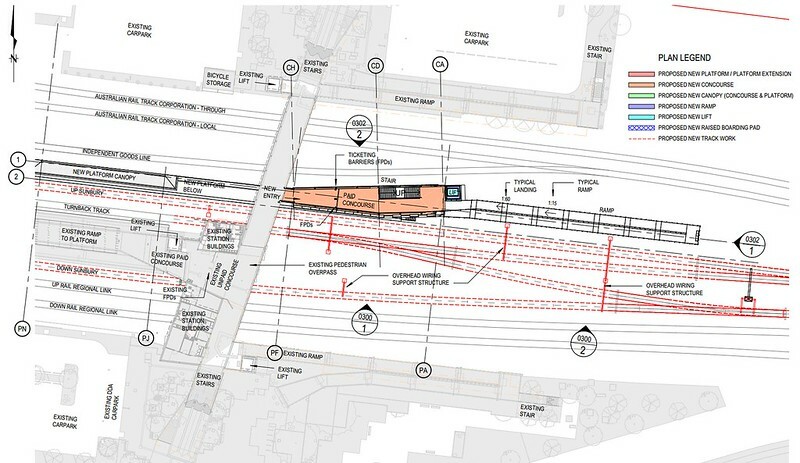 What’s not clear from the plans is whether the turnback track will join the track west of the station – so that trains from Tottenham could stop on either Platform 1 or 2. Looks like works aren’t too far away from starting – the area between the inbound track and the freight line (where the new track and platform are going) has already been fenced off. Hopefully the works at West Footscray can be done without any impact on regional services when they’re working on the outbound track. I was also wondering whether there would be an Eastern Turnback – where would they fit one near Malvern? Westall would also do the job, but that’s probably like terminating trains at Watergardens in the west. Re South Yarra’s lack of platforms – I really wonder why they couldn’t have just used the existing platforms 5 & 6, and put the tunnel portal at the city end of those platforms, diving under the other 4 tracks, and using a tunnel under Domain Rd to get to Anzac station, instead of under Toorak Rd. 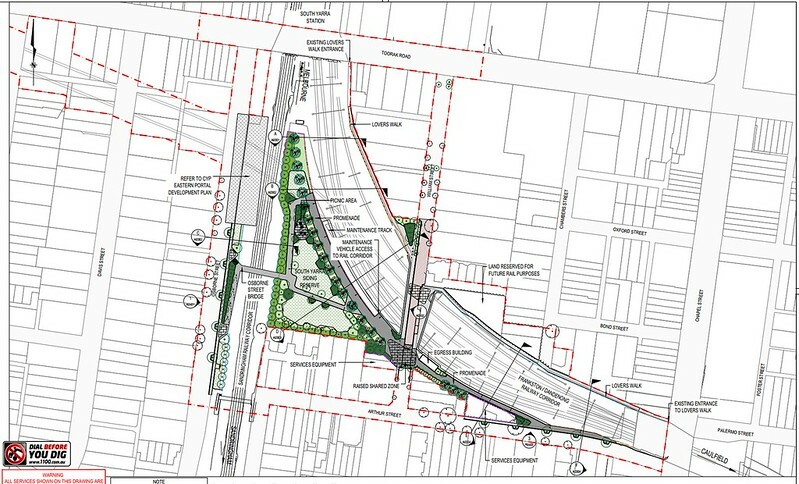 If you look at the plans for the Western Portal more closely you’ll see that it’s off to the side of the current Sunbury Line tracks between Footscray and North Melbourne. Those tracks aren’t being abandoned; in any case, to do so would be quite short-sighted: even once the HCMTs are lengthened beyond 7 cars they could use those tracks to run into Platform 8 at Southern Cross if the tunnel is closed for trackwork or by some other disruption. @Steve, in terms of construction impacts, the issue might be if they have to close the existing Sunbury tracks to dig out/build the portal. I think the Malvern turnback is planned to not have a platform… perhaps in the former goods yard adjacent to Malvern Central – presumably with the outbound track moved so the siding is in the middle? I guess the operational need identified is to provide services through the inner core if there’s a disruption further out, given the importance the tunnel will have for passengers using the new stations, including those changing off other lines. @Toby, I dunno – the diagrams don’t seem to show the existing tracks being retained and connecting to the tracks from the portal. This is in contrast to the Eastern Portal diagrams which do show a junction. Also not shown are the existing crossovers near South Kensington allowing Sunbury trains to switch to the Werribee tracks to reach the city. Not clear to me if these will be replaced elsewhere – but I’m assuming not – in line with the general philosophy of continuing to separate out the different lines, as well as minimising points to reduce delays and failures. The cost is flexibility of course. Why does Metro1 go to Sth Yarra at all? I t does not stop there and does not reduce congestion through to Caulfield. Could they not have done skyrail down St Kilda Rd then Dandenong Rd to Malvern or Caulfield. New stations and probably cheaper. I would build the new platform as a bay platform where is says “wiring support structure”, east of the road bridge, directly connected to the existing island platform. Caulfield Stn has been designated as the Frankston line interchange east of the tunnel. Similar to the current arrangement. QUICK RFI feedback, with some additions of my own. ++ RFI are campaigning for, once electric trains reach Waurn Ponds, to have those terminate at South yarra, making use of the platform(s) now used by Dandenong group trains. ++ The need for a turnback at West Footscray is, due to the fact that, while they are keen to have what trains they can, operate through between Sunbury and Pakenham/Cranbourne without any short-route services, the demand for the Dandenong side, will be much larger than that for the Sunbury side. So, you will get mostly Pakenham/Cranbourne to Sunbury, and Pakenham/Cranbourne/Dandenong to West Footscray runs. 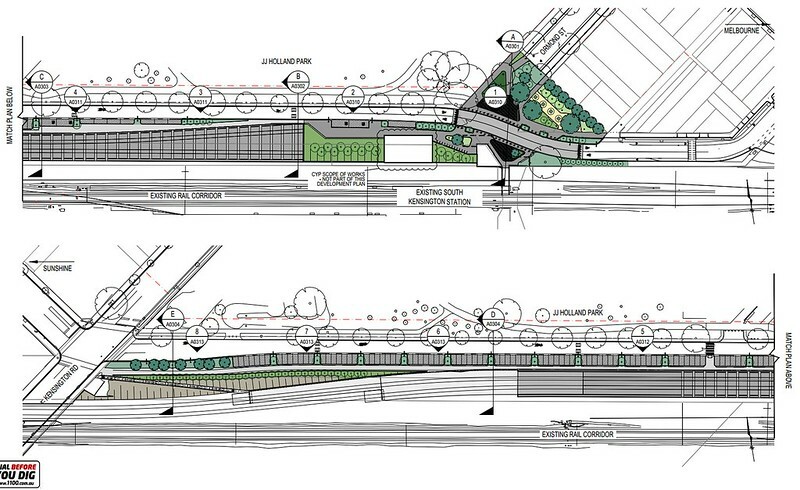 ++ There has been provision in the plans, to add a new station at South Yarra. One can presume that, once the approval is given, the then, existing trains shall not be disrupted at all during the construction of the South Yarra platforms. For this, I may add that, it would have been prudent to have a turnback platform constructed at Footscray. Divert the existing Up trains to run underneath the nearby road, and use existing #1 for the turnbacks. There is more than enough room at Sunshine for the same thing to happen. They just need to build a through track on the other side of the current #1, and build it perhaps, 100m towards the up. I think the West Footscray option is being done, because there is much more land located there. They could build a third platform there quite easy. However, given the massive works that are going to be due with the Airport railway at Sunshine, who knows what is going to happen there. Given the community consultation that went on in respect to the latest SkyRail proposal, on the Glen Waverly line…… need I say more about Andrews and his community consultation procedures. Why cant they turnback at Caulfield? Perhaps we should have retained Oakliegh, otherwise we must go all the way out to Westall? The western turn back at West Footscray makes more sense than Footscray or Sunshine. As for the Western Portal, there will be no flat junction allowing the new Sunbury-Cranbourne trains the ability to avoid the tunnel and continue through to North (to be be West) Melbourne. The plans clearly show that the line will begin to divert and decline within the current boundary of the inbound line (see cut-through Section E on page 55 and page 43). Any potential flat junction would therefore require realignment of the Werribee line and the rebuild of the Kensington Road bridges. However, as this document is for the Portal, it is outside of scope to remove the existing truncated lines and hence they still appear in cut-throughs on pages 52-54. As for uses for this truncated Sunbury line which will effectively dead-end, I am unsure what PTV envisage but the removal of at least one line would allow the rebuild and widening of the Sth Kensington city bound platform with no realignment of the Werribee line. Indeed, a turn back here may also be possible, but it misses the potential passenger catchment of Footscray mentioned above. I think the way they’re designing the portals is a bit shortsighted. In the obsession with turning Melbourne’s suburban lines into a metro, they’re pushing to separate tracks by destination rather than service type, and this will severely limit the running of express services in future. What would be better is designing the system around a tiered network, with all-stops inner suburbs services that terminate at middle ring suburbs, and outer suburbs trains that run express between there and the city. Melbourne’s lines are simply too long to be all-stops services. Taking the Caulfield group as an example, you could run all-stops local trains to Dandenong, and the Pakenham/Cranbourne services would stop all stops from the terminus to Dandenong, and then stop only at Clayton, Oakleigh, Caulfield, South Yarra, Richmond. Frankston local services would start at Mordialloc, and express services would skip all but one or two stops between there and Caulfield. The tracks between Caulfield and the city should be resignalled Up Fast / Up Slow / Down Slow / Down Fast, with the slow tracks going into the Metro Tunnel. Sure, it’s a slightly more complicated network, but the design offers considerably more flexibility and redundancy than what is proposed. Sydney does something like this, and it works quite well, but they’ve had the sense to quadruplicate a lot of their lines to eliminate conflicts. Zürich also does something similar, but instead of quadruplicating lengthy sections, they have additional platforms at the interchange stops and hold local services so that expresses can overtake. Japan does the same, and they get an absolutely phenomenal number of services on a single track pair. I’m actually pretty amazed that what is considered routine operations for the Swiss and Japanese is regarded as being impossible here—why aren’t we striving to learn from the most efficient operations in the world? At the other end, the portal for South Kensington retains a flat junction for the occasionally-used tracks direct to North Melbourne. Given that they’ve got to dig up the entire area, I proposed a redesign with a dive between the Up and Down tracks and a rebuilt South Kensington station, which was regarded as being “outside the project scope” when I sent the drawings to them. There’s a similar issue with the turnback at West Footscray: due to a refusal for all three companies that own tracks in the area to talk to one another and work together, the additional platform is being built in an awkward location. It would be trivially easy to slew the goods bypass lines in/out of Tottenham Yard, and build a new island platform that services both City-bound tracks, with the terminating road having faces on both sides so passengers get cross-platform interchange in both directions.